To mark the International Day for Older Persons-2017, Palli Karma-Sahayak Foundation (PKSF) and Forum of the Rights of the Elderly, Bangladesh (FREB) jointly organized a discussion in PKSF Bhabanon 14 October 2017. MrAsaduzzaman Khan, MP, Hon’ble Minister for Home Affairs was the chief guest at the programme chaired PKSF Chairman Dr Qazi Kholiquzzaman Ahmad. 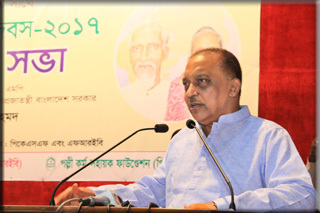 In his speech, the Home Minister said the elders are never a burden. They can pass their knowledge and wisdom to the younger generations so that the latter can take the country forward. Mr Asaduzzaman Khan also highlighted different pro-elderly measures of the government. Dr Qazi Kholiquzzaman Ahmad said that social values ​​in the country are waning. But it is possible to turn things around through proper education. He also mentioned the programmes taken by the PKSF for the welfare of the elderly. “No one should be left behind — that’s the essence of the Sustainable Development Goals,” he said, calling for united moves to ensure human dignity for all. PKSF Managing Director Mr Md Abdul Karim and FREB Vice President Maj Gen (Retd) Mr Jibon Kanai Das gave the welcome speeches. 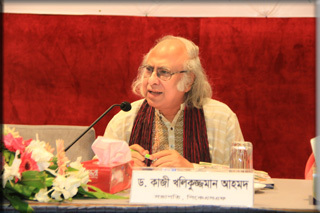 Mr Kazi Reazul Haque, Chairman of National Human Rights Commission, Bangladesh; Advocate Hosne Ara Lutfa Dalia, MP; and Mr. Golam Sarwar, Editor of the Daily Samakal were the Guests of Honor.